Owning a Lodge 11" gradated red color enamel skillet means that you will have a piece of cookware in your kitchen that your children can use one day! 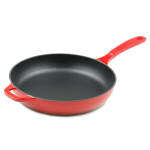 This Lodge color enamel 11" skillet will be a beautiful part of your kitchen for years and years to come! Flawlessly crafted to braise or saute your favorite cuts of meat or vegetables, this Lodge color enamel skillet features a gradated red finish! Because it is constructed of enamel coated cast iron, this Lodge color enamel skillet you get the stylish and smooth grip of glass but with the even heating of cast iron. The 11" diameter is great for small to medium applications and the 1-3/4" depth allows you to cook without splashing or overflowing. Lodge enamel cookware is not recommended for commercial settings. A good high quality skillet.